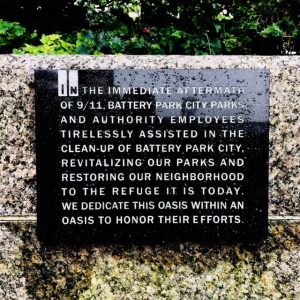 The 9/11 Memorial in South Cove commemorates the heroic efforts of Battery Park City staff, past and present, in the days following the September 11th attacks. 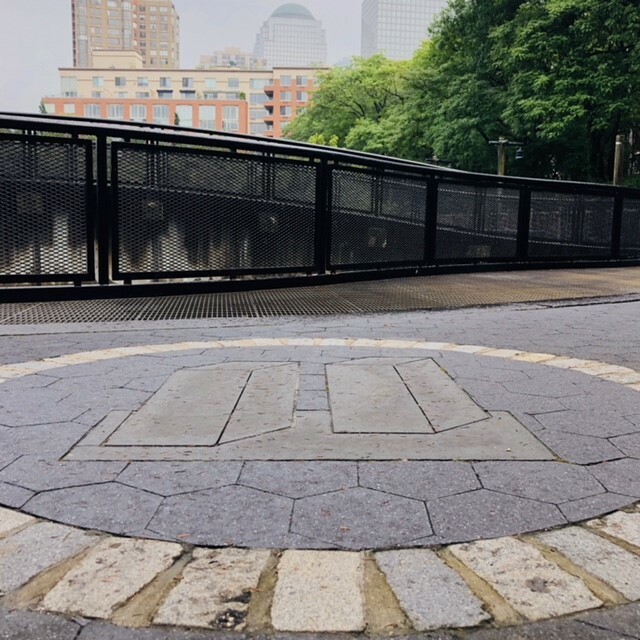 The Memorial includes a simple plaque and “Circle of Remembrance” as permanent fixtures to honor the sacrifice and dedication displayed by all those who helped restore the Battery Park City community following the devastation. Created and dedicated on September 9, 2015 by the Battery Park City Authority. The Irish Hunger Memorial is designed to raise public awareness of the events that led to the famine of 1845-52 and to encourage efforts to address current and future hunger worldwide. One and a half million Irish were lost through famine related death and the Diaspora. The design expresses a desire to react and respond to changing world events without losing its focus on the project’s commemorative intent. Central to Tolle’s project is an authentic Famine-era cottage donated to the Memorial by his extended family, the Slacks of Attymass, County Mayo, Ireland. The cottage has been painstakingly reconstructed on the Memorial’s halfacre site as an expression of solidarity to those who left from those who stayed behind. From the cottage, visitors to the Memorial meander along paths winding through a rugged landscape thickly planted with native Irish flora-plants often found growing in fallow fields. Ascending to an overlook twenty-five feet above the ground, the visitor confronts a breath-taking view of the Statue of Liberty and Ellis Island beyond.This landscape is cantilevered over a stratified base of glass and fossilized Irish limestone, presenting a theater of historical and modern sentiments about famine worldwide. Layers of mutable text, appearing beyond touch as shadows upon the glass, wrap around the exterior of the Memorial and into the passageway leading to the cottage while accounts of world hunger are heard from an audio installation overhead. Brian Tolle is an internationally renowned sculptor and public artist. His recent public works include Waylay for the Whitney Biennel in Central Park, New York (2002), Man’s Achievements on a Shrinking Globe in an Expanding Universe for the Queens Museum of Art, New York (2001) and WitchCatcher at MetroTech Center Brooklyn, New York (1997) reinstalled in New York City Hall Park, New York (2003). Using a variety of media, Tolle's works draw themes from the scale and experience of their surroundings provoking a re-reading by cross-wiring reality and fiction. In much of Brian Tolle's work he uses cutting-edge technology in unexpected ways, blurring the border between the contemporary and the historical. The 30,000-square-foot Museum of Jewish Heritage is located on the waterfront at 36 Battery Place in Battery Park City. With its six-sided shape and tiered roof symbolic of the six points of the Star of David and the six million Jews who perished in the Holocaust, the Museum has proved a powerful attraction as one of New York City's newest cultural destinations. The Museum goes beyond recounting the horrors of the Holocaust; Its mission is to educate people of all ages and backgrounds about the broad tapestry of Jewish life over the past century - before, during, and after the Holocaust. The Museum began construction on an 82,000 square-foot addition in fall 2001. The four-story wing, designed by Kevin Roche John Dinkeloo and Associates, architects of the original Museum building, contains Safra Hall, a state-of-the-art theater suitable for films, lectures and performances; a memorial garden entitled Garden of Stones created by Andy Goldsworthy; classrooms; a resource center and library; a living history center; expanded gallery space for temporary exhibitions; offices; Abigael's at the Museum, a kosher cafe operated by celebrity chef Jeff Nathan; and an event/catering hall. The wing was named in honor of Robert M. Morgenthau, the Museum's Chairman and Manhattan District Attorney, in April 2003. In 2004, the Skyscraper Museum opened a permanent home in a building at the southern tip of Battery Park City. The facility occupies ground-floor space in a mixed-use project that includes the Ritz-Carlton Hotel and a 38-story condominium tower. The Museum owns its space, which has been generously donated by Millennium Partners, the building's developers. The distinguished firm of Skidmore, Owings & Merrill (SOM) is the Museum's architect, with award-winning partner Roger Duffy as lead designer. SOM has provided its services pro bono. Tishman Construction Corporation, which has been building New York since 1898, has served as Construction Manager pro bono. The new facility contains two main galleries: one for the core exhibit Skyscraper/City on the evolution of New York's commercial skyline, another for changing shows. With a permanent home, the Museum has begun to collect and preserve important artifacts of high-rise history, to organize an active education program, and to celebrate New York's rich architectural heritage. With the skyline of Lower Manhattan as its immediate backdrop and the panorama of New York harbor at its front door, the Museum enjoys a site of breathtaking beauty and an unmatched location for cultural tourism and serves as a vital element in the changed landscape of downtown. A short walk from the historic skyscrapers and canyons of lower Broadway and Wall Street, and minutes from the embarkation point of boats to Ellis Island and the Statue of Liberty, the Museum stands at a nexus of past and present that attracts over 10 million tourists annually. Other nearby attractions include the New York Stock Exchange, the Museum of the American Indian, Trinity Church, the Museum of Financial History, and the neighboring Museum of Jewish Heritage. Of particular relevance is "ground zero", which will continue to command global interest in Lower Manhattan. Created in honor of those who lost their lives in the line of duty, the Police Memorial is located at Liberty Street and South End Avenue, and was dedicated on October 20, 1997. Stuart Crawford, architect, won a juried competition by using water as the primary integrating element.The wall along the edge of the memorial holds the names of the officers and dates on which they were killed. The small fountain resides outside of the formal memorial represented the rookie's first day. The water flows down the flume past the granite wall, representing death, and then falls into the open pool. The remaining area around the pool is referred to as the "Sacred Precinct" where contemplation is encouraged. NOTE: Construction is currently underway on the Police Memorial's electrical vaults, which are being reconstructed above ground as a climate resiliency measure. More detail about this project, scheduled to run through spring 2017, may be found here. Created in honor of those who lost their lives in the line of duty, the Police Memorial is located at Liberty Street and South End Avenue, and was dedicated on October 20, 1997. Stuart Crawford, architect, won a juried competition by using water as the primary integrating element.The wall along the edge of the memorial holds the names of the officers and dates on which they were killed. The small fountain resides outside of the formal memorial represented the rookie's first day. The water flows down the flume past the granite wall, representing death, and then falls into the open pool. The remaining area around the pool is referred to as the "Sacred Precinct" where contemplation is encouraged. This 12 foot high, 8 foot wide, 2.75-ton section of the Berlin Wall was given to the Hugh L. Carey Battery Park City Authority, by the German Consulate, in recognition of the 15th anniversary of the fall of the Berlin Wall, and the Authority's commitment to education through the display of public art. Erected by the East German regime, the Berlin Wall for almost thirty years helped to hold millions of people captive under communism. On November 9, 1989 the Wall was finally brought down by the yearning of the people of East Germany to live free. This segment once stood in downtown Berlin in the area between Potsdamer Platz and Leipziger Platz. It was part of the inner wall designed to prevent East Germans from escaping. Today, it stands as a powerful symbol of the strength of democracy - teaching and inspiring all who visit Kowsky Plaza of the importance of freedom. Eleven Tears, designed by Ken Smith, is a graceful and elegant tribute to the 11 American Express employees who died on September 11, 2001. The installation consists of an 11-sided, 600-pound piece of natural Brazilian quartz that resembles a gigantic tear. this "tear" is set in a steel ring suspended from a 35-foot-high ceiling by 11 cables, and hovers over an 11-sided black granite fountain with the names of the employees etched into the granite, along with five words or phrases that describe the person. Drops of water gently fall like tears over these inscriptions. Nearby is a panel that gives further biographical details on each person. Ever since September 11, Smith had been preoccupied with the sky because the towers were so much a part of the sky. He wanted to bring the ceiling and the floor together as sort of a metaphor for sky and ground or heaven and earth. Ken Smith is a landscape architect who lives and works in the former "frozen zone," the area bordering The World Trade Center that was evacuated after 9/11.